Throughout the 1970s and 1980s nearly every production sailboat manufacturer I can think of offered a model in the 27-foot size range. This was a popular and economical size boat for sailors moving up from daysailers to club racer/cruisers or for couples or small families looking for their first weekend cruiser. Cal Boats, of Costa Mesa, CA, introduced its second 27 foot model designed by Bill Lapworth in 1975 and called it the Cal 2-27. 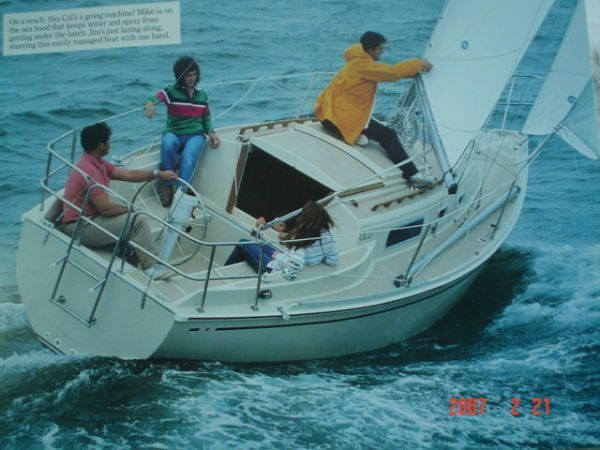 In 1983, the deck mold was redesigned, the keel and rig modified, and the model was renamed the Cal 27 Mk III which remained in production through 1985. Both models share a common overall length of 26’ 7", although other dimensions vary slightly between models and years. Draft of the 2-27 model was a consistent 4’ 3", while two keel configurations were offered on the Mk III. The shoal draft keel drew 4’, and the deep draft keel drew 5’. The hulls of these models are constructed of solid fiberglass laminate, while decks are built with cored composites. Structural support is provided by partial fiberglass liners and random full and partial bulkheads. Generally speaking, the construction is on a par with other production builders such as Catalina and O’Day. Significant structural problems are not typical, although leaking ports, deck hardware, and chainplates are commonplace. When undetected or ignored, leaks can lead to more serious damage to the main bulkhead to which the rigging chain plates are attached. Any water stains around the chain plate attachments are likely to indicate some repair is needed. Ignoring repairs and maintenance could lead to an eventual rigging failure. There are slight differences in the foredecks of the Cal 2-27 and the Mk III. Both are unobstructed and have sufficient area for handling sails and ground tackle, although the Mk III model has the added convenience of an anchor locker for storage of ground tackle. There are welded stainless steel rails at the bow and stern and a single life line supported by stainless steel stanchions along the side decks. The side decks are wide enough to walk along safely, and there is a molded fiberglass toe rail which offers an added degree of security. Life line stanchions were not installed with suitable backing plates and may have weakened over the years. Minimum standards require that stanchions and life rails not fail when a 400-pound load is placed at any point. This is a difficult test to replicate in the field, but if stanchions bend or there is noticeable flexing of the deck when an adult’s weight is placed against the top of a stanchion or rail, chances are good some repair or reinforcement is needed. The cockpit can accommodate three to four adults, although, from a practical standpoint, two people are about the limit for a boat this size with tiller steering. Other guests and crew are likely to find more comfortable seating along the weather rail and leaning back along the high sides of the cabin trunk. Even by today’s standards the accommodations of the Cal 27 are impressive, particularly when you consider the actual overall length is less than 27 feet. The layout is conventional with v-berth forward followed by an athwartships head and main saloon with port and starboard settees. The galley stretches from port to starboard across the aft end of the saloon. The Mk III model has an additional starboard quarter berth, and both models have a dinette table that folds up against the forward bulkhead of the main saloon when not in service. There are better than 6-feet of headroom throughout, and all berths are at least 6-feet in length. Storage is limited but adequate for this size boat. From 1975 until 1978 purchasers had their choice of outboard, inboard gas, or inboard diesel engines for auxiliary power. Outboards were typically 9.9 hp, and optional inboard engines included the 25 hp Universal Atomic 4 gasoline or 12 hp Faryman diesel. Of the three, the Atomic 4 was the best choice. From 1979 through 1985 diesel inboard engines were standard and were typically either 11 hp Universal or eight hp Yanmar models. These engines provide reliable service, but horsepower is marginal for running against strong currents or into strong winds and head seas. The displacement/length ratio of the Cal 2-27 is 278, slightly less on the Mk III, and sail area/displacement ratio is in the range of 16.8. Both of these numbers would be considered moderate when these boats were built but high and low respectively when compared to current production. Generally the Cal 27 sails well in moderate wind conditions of six to 14 knots. She is a bit sluggish in light air, is prone to weather helm if overpowered, and reefing is usually in order when beating in wind above 15 knots. Rising labor and materials cost have made it nearly as economical for boatbuilders to build 30 footers as 27 footers, and the popularity of the 27 footer has diminished considerably with new boatbuilders and buyers over the last several years. However, there is still a strong market for used boats in this size range, and the Cal 2-27 and Mk III remain a popular choice. They make good daysailers, and club racers and offer reasonable accommodations for weekend and short distance cruising.